74 U.S.A., Danville Turnpike Road, (NH), certificate No.273 for one share, 1815, ornate border, small format, black, embossed seal, scarce, paper shows ageing, otherwise VF. (1). 76 U.S.A., Lewisburg Bridge Co., (PA), certificate No.963 for one share, made out to the Commonwealth of Pennsylvania, 1818, company was formed to erect a bridge over the west branch of the Susquehanna at Lewisburg, ornate border, small format, black, embossed seal, VF. (1). 78 U.S.A., Rome Turnpike Co., (NY), 5 x unissued certificates of capital stock, circa. 1820s, scrollwork at left showing date of incorporation as 1819, black, with counterfoils, mostly AVF. (5). 6 Brazil, Brazil Railway Co., bonds for £100, £200, and 500 francs, all 1909, and 2 x warrants for preference shares, 1910-12, all with same vignette of train crossing bridge, also bond for 500 francs, 1909, with different vignette of train crossing brick built bridge, various colours, mostly VF. (6). 9 Canada, Montreal City Land Co. Ltd., 3 x debentures for $1,000, all 1911, vignette of allegorical figures, black on green, with coupons, also certificate for common stock, 1911, all VF. (4). 11 Canada, Northern Light, Power & Coal Co. Ltd., bond for $100, large vignette incorporating river, power plant and city scene, black & brown, with coupons, VF. (1). 14 Chile, Compania Salitrera de Tarapaga y Antofagasta, 10 x certificates for one share, and 8 x certificates for ten shares, 1934-52, vignette of man sewing seeds, blue and mauve respectively, all with UK revenue stamp, all with coupons, all VF or better. (18). 16 China, Chinese Government 1913 Reorganisation Gold Loan 1913 bond for £20,The Hong Kong and Shanghai Bank issue, with vignette of Mercury and Chinese scenes, brown, with coupons. AEF (1). 17 China, Chinese Government Treasury Notes, dated 1919, (Vickers Loan), bond No.9801 for £500, vignette of river scene, black & blue, with coupons, VF. (1). 18 China, Chinese Government Treasury Notes, dated 1919, (Vickers Loan), bond No.9937 for £1,000, vignette of river scene, black & brown, with coupons, AVF. (1). 19 China, Chinese Imperial Government 1898 Gold loan bonds for £50 (blue) and £25 (brown) Deutsch-Asiatische Bank issue, no coupons remain, both with cancellation holes. AVF. 21 China, Imperial Chinese Government 1908 Gold Loan bond for £20, French issue, with vignette of walled city, green, right and bottom margins uneven from where coupons cut off for payment, no coupons remain. AVF (1). 22 China, Imperial Chinese Government Hukuang Railways 1911 Gold Loan, bonds for £20 and £100, both Hongkong and Shanghai Bank issue, vignette of train, black & green and black & red respectively, both with coupons, both VF. (2). 23 China, Imperial Chinese Government Tientsin-Pukow Railway Loan, 2 x bonds for £100, London 1908, both bonds have been stamped £50 repaid and have the replacement blue coupon sheets, large format, black & orange, AVF. (2). 24 China, Lung-Tsing-U-Hai Railway 1913 Gold Loan, 20 x unissued bonds for £20, ornate border, large format, black & blue, with full coupon sheet, all EF. (20). 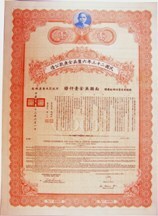 25 China, Lung-Tsing-U-Hai Railway 1913 Gold Loan, 5 x issued bonds with coupon sheets attached. Together with Lung-Tsing-U-Hai Railway 1921 coupon sheets . 26 China, Lung-Tsing-U-Hai Railway 1921 Loan, 30 x bonds for 500 francs, ornate border, black & green, with coupons, some fixed with tape mostly VF. (30). 27 China, Republic of China Secured Sinking Fund Bonds of 1937, (also known as Pacific Development Loan, bond No.M4051 for $1,000, attractive vignette of pagoda, black & blue, with coupons, VF. (1). 28 China, Republic of China Two Year 1919 Gold Loan Treasury Notes, bond No.1728 for $1,000, attractive vignette of pagoda, black & orange, with coupons and scrip certificate, VF. (1). 29 France, Etablissements Vve. Garres & de Penanros Fils, 10 x certificates, Bordeaux 1925, vignette of pea pods, black & red on yellow, with coupons, mostly VF. (10). 37 Great Britain, 6 certificates all health related, Parke?s Drug Stores Ltd., 1920, First Aid Services Ltd., 1937, London Stereoscopic Co. Ltd., 1920, Taylors (Cash Chemists) Trust Ltd., 1933, London Clinic & Nursing Home Ltd., 1929, and Hospital Enterprises Ltd., 1935, VF. (6). 38 Great Britain, 6 certificates relating to Cornwall, Central Cornwall China Clay Co. Ltd., 1919, East Pool and Agar Ltd., 1918, Wheal Reeth Tin Ltd., 1936, Dolcoath Mine Ltd., 1927, Great Work Tin Mines Ltd., 1935, and Wheal kitty Tin Ltd., 1926, mostly VF. (6). 43 Great Britain, Consett Spanish Ore Co. Ltd., 9 x certificates for one share, all 1873, ornate heading, black, also transfer certificate dated 1889, all certificates have a little staining and creasing to right hand margin, otherwise VF. (10). 45 Great Britain, Fellows Magneto Co. Ltd., 2 x certificates for ordinary shares and 3 x certificates for preferred shares, 1918-19, ornate design, various colours, mostly VF. (5). 50 Great Britain, Macclesfield Canal Navigation, manuscript transfer for two shares, 1826, bottom right corner has been cut away, (perhaps to remove duty stamp), folded, otherwise AVF. (1). 51 Great Britain, Manchester Ship Canal Co., £100 registered redeemable debenture, 1927, attractive design with vignette of ship at top, blue on buff, printed by Bradbury Wilkinson, UK revenue stamp, VF. (1). 53 Great Britain, Nidderdale Lead Mining Co. Ltd., certificate for two preference shares, 1865, vignette of entrance to mine at Pateley Bridge, Yorkshire, black on pink, minor damage to right edge, otherwise VF. (1). 55 Great Britain, Plymouth, Devonport, and Stonehouse Cemetery Company, scrip certificate for four £25 shares, 1846, small format, brown on cream, scarce, only one known, AVF. (1). 63 Irish Lottery Tickets (2) July 1800 1/16th share ticket & 1801 1/16th share ticket. AEF. 65 Italy, Société Anonyme for the Sale of State Domains of the Kingdom of Italy, coupons de jouissance to bearer, series K and series D, both 1865, both ornate with Italian arms at top, also S.p.A. Silos di Genova, 2 x certificates, both 1953, and Societa della Ferrovia Sicula Occidentale Palermo-Marsala-Trapani, unissued, Rome 1930, all VF. (5). 67 Mexico, 60 x National Railways of Mexico certificates for 10 shares, 1909-1913, green. Together with a torn Panama Canal Cartificate and Polberro Tin Mine certificate 1939. 68 Mexico, Mexico North Western Railway Co., bond for £100, dated 1909, vignette of speeding passenger train, ornate border, black & blue, UK revenue stamp, with coupons, VF. (1). 69 Norway, Dunderland Iron Ore Co. Ltd., 2 x certificates for ordinary shares and 2 x certificates for preference shares, 1902-22, ornate design, black and green respectively, mostly VF. (4). 71 Peru, Compania Nacional del Ferrocarril Mineral de Pasco, bond for 500 soles, Lima 1872, very attractive vignette of train crossing bridge with cattle in foreground, black & blue, with coupons, VF. (1). 93 U.S.A., Centre Turnpike Road, leading from Reading to Sunbury, certificate for one share, dated 1821, share held by the Commonwealth of Pennsylvania, scrollwork at left, small format, black, embossed seal depicts gate, very clean condition for age, VF. (1). 94 U.S.A., Denver and Rio Grande Railroad Co., certificate for preferred stock, 1908, vignette of miners digging with mountains in background, black & orange on yellow, UK revenue stamp, AVF. (1). 96 U.S.A., Robbstown and Mountpleasant Turnpike Road, certificate No.185 for one share, dated 1826, share held by the Commonwealth of Pennsylvania, very small format, black, feint embossed seal, some edge damage which affects one of the signatures, otherwise AVF, scarce. (1). 97 U.S.A., Susquehanna Bridge Company, Mc Call?s Ferry, certificate No.357 for one share, dated 1814, made out to the Commonwealth of Pennsylvania, the companies object was to erect a permanent bridge over the Susquehanna River at or near Mc Call?s ferry, ornate border, black, embossed seal, very clean condition for age, VF. (1). 1 Australia, Australia and New Zealand Bank Ltd., share certificate, London 1959, ornate heading, printed by Waterlow, black, VF. (1). 4 Australia, Union Bank of Australia, share certificate, 1864, black on pink, AVF. (1). 6 Brazil, Leopoldina Terminal Co. Ltd., 2 x debentures for £100, both 1911, vignette of tram terminus, black & red, with coupons, AVF. (2). 10 China, 10 certificates, Banque Industrial de Chine, 3 x certificates dated 1913, and 2 x certificates dated 1920, all very ornate with dragons, pagoda and town view, Société Belge d?Entreprises en Chine, 1924, Compagnie Générale de Chemins de Fer en Chine, unissued, Compagnie Financière Belgo-Chinoise, 1926, issued and unissued, also Compagnie Générale de Chemins de Fer et de Tramways en Chine, 1920, all with coupons, all VF or better. (10). 11 China, Chinese Government 1912 Gold Loan, 3 x bonds for £20, ornate design, black & blue, with coupons, all VF. (3). 13 China, Chinese Government 1913 Reorganisation Gold Loan, 2 x bonds for 505 francs and 1 x 189.40 roubles, Belgian issue, vignettes of Mercury and Chinese scenes, black & brown, with coupons, all VF. (3). 14 China, Chinese Government 1913 Reorganisation Gold Loan, bond for 505 francs, vignettes of Mercury and Chinese scenes, black & brown, with coupons, top ribbon binding missing, otherwise VF. (1). 21 China, Imperial Chinese Government Tientsin-Pukow Railway Loan, 2 x bonds for £100, ornate design, large format, black & orange, with coupons, both VF. (2). 23 China, Lung-Tsing-U-Hai Railway 1913 Gold Loan, 30 x unissued bonds for £20, ornate border, large format, black & blue, with full coupon sheet, all EF. (30). 24 China, Lung-Tsing-U-Hai Railway 1921 Loan, 30 x bonds for 500 francs, ornate border, black & green, with coupons, mostly VF. (30). 26 China, Republic of China Two Year 1919 Gold Loan Treasury Notes, bond No.1756 for $1,000, attractive vignette of pagoda, black & orange, with coupons and scrip certificate, VF. (1). 28 Ethopia, Chemins de Fer Ethiopiens, certificate for 500 francs share, Paris 1899, large vignette of King and entourage awaiting approaching train, brown & yellow, with coupons, VF. (1). 31 Grat Britain, The Ship ‘Penrhyn Castle? Co. Ltd., share certificate, 1890, black, embossed seal clearly depicts the castle, VF. (1). 32 Great Brirtain, Lancaster Corporation, printers proof for redeemable stock, 18--, ornate design incorporates coat of arms, printed on thick card, black, VF. (1). 34 Great Britain, 23 certificates, mostly retail related, dated 1879-1976, titles include, New Brewery Co. Carlisle Ltd., 1879, Fortnum & Mason Inc., 1931, Sears Holdings Ltd., 1970, Brooke Bond Liebig Ltd., 1973, Bass Charrington Brewers Ltd., 1975, A.& F. Pears Ltd., 1947, Abbe Daney Fire Extinguisher Co. Ltd., 1912, National Sporting Club Ltd., two types, 1937, Hans Crescent Hotel Co. Ltd., 1931, a little duplication, mostly VF. (23). 35 Great Britain, 25 certificates, dated 1929-1976, titles include, Imperial Chemical Industries Ltd., 1956, Van Dyk Consolidated Mines Ltd., 1943, Roan Antelope Copper Mines Ltd., 1955, Konongo Gold Mines Ltd., 1956, Yagerphone Ltd., 1929, Smith?s Potato Crisps Ltd., 1965, Prince of Wales Dry Dock Co. Swansea, Ltd., 1954, a little duplication, mostly VF. (25). 36 Great Britain, 36 railway dividend counterfoils, dated 1857-1906, 11 different railways, no duplication of dates, titles include, North Eastern, London Brighton and South Coast, North British, London and South Western, Great Eastern, Buckinghamshire, Midland, Metropolitan, mostly VF. (36). 38 Great Britain, 8 Victorian share certificates, Peninsular Co. Ltd., 1867, Norfolk Estuary Co., 1847, Charles Rowley & Co. Ltd., 1874, Joint Stock Contract Association Ltd., 1875, Liverpool Sewage Utilization Co., 1868, International Land Credit Co. Ltd., 1864, Gas Light & Coke Co., 1870, and European & American Steam Shipping Co. Ltd., 1857, mostly VF. (8). 40 Great Britain, British & Commonwealth Shipping Co. Ltd., certificate for preference shares, 1956, very attractive multicoloured border, incorporating flags, crown, anchor, thistles and roses, VF. (1). 44 Great Britain, Consett Spanish Ore Co. Ltd., 7 x certificates for one share, all 1873, ornate heading, black, all VF. (7). 45 Great Britain, English & French Bank Ltd., bearer share warrant for one share, 1881, vignette of allegorical figures with train and ship in background, black, UK revenue stamp, with coupons, VF. (1). 48 Great Britain, Mendip Hills Mining Co. Ltd., 10 x certificates for one share, all 1856, small format, brown, all VF or better, (10). 52 Great Britain, Rank Organisation Ltd, 19 x certificates, dated 1960-1977, eight different types, four have the ink stamp signature of Lord Rank (J.Arthur Rank, founder of Rank Films), all have large underprint of the Rank trade mark of a wrestler in a loincloth striking a large gong as used in the opening frames to all Rank movies, various colours, F-VF. (19). 53 Great Britain, Rugby, Derby & Manchester Railway, 4 x certificates for five shares, and 4 x certificates for ten shares, all 1845, ornate heading, blue and brown respectively, all have top right hand corner cut away to cancel, mostly F-AVF. (8). 54 Great Britain, Vickers Ltd., 3 x stock certificates, 1940-1954, two types, all with Vickers trade mark at left, black on green and black on pink, F-VF. (3). 56 Great Britain, White Star Line Ltd., certificate for preference shares, 1928, ornate design with company?s flag at left, red, VF. (1). 61 Italy, Genoa and District Water Works Co. Ltd., £20 debenture, 1913, very attractive vignette of Genoa harbour with many ships, text in English and Italian, black & red, with coupons, VF. (1). 62 Mexico, City Council of Oaxaca, 3 x bonds for 1,000 pesos, all 1910, ornate with vignette of females head, black & orange, will coupons, also National Railways of Mexico, certificate dated 1910 and bond dated 1907, mostly VF. (5). 64 Palestine, Palestine-British Bank Ltd., 15 x bearer certificates for ten shares, all 1963, ornate border, black & green, all with UK revenue stamp, all with coupons, all AEF. (15). 72 Russia, Companie du Chemin de Fer de Moscou-Windau-Rybinsk, 5 x bonds for 500 francs, all 1903, ornate border, black & green, all with coupons, all VF. (5). 74 Russia, State Loan of 1906, 5 x bonds for 500 francs, 6 x bonds for 2,500 francs, and bond for 5,000 francs, ornate border, various colours, with coupons, mostly VF. (12). 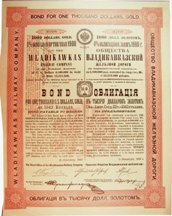 76 Russia, Wladikawkas Railway 1900 Loan, bond for $1,000, ornate border, black & red, as usual with this issue no coupons remain, VF. (1). 79 Spain, Compania del Ferro-Carril Trasversal del Principado de Cataluna, 23 x titulo de fundacion al portador, all Barcelona 1883, very ornate design incorporates, figures, columns, town, train on bridge, black on yellow, with coupons, mostly VF or better. (23). 80 Spain, Valencia and Liria Railway Co. Ltd., 11 x bearer warrants for one share, all 1888, attractive design with ornate border, text in English, French and Spanish, brown on cream, UK revenues stamp, with coupons, all VF. or better. (11). 85 U.S.A., Camp Floyd Silver Mining Co. Ltd., 3 x certificate for one share, all 1871, operated in Utah, scrollwork at left, black on olive, all VF. (3).